The report, written by the Scottish Basic Income Steering Group, highlights learning from basic income pilots underway or in planning in Finland, Ontario and the Netherlands, compiled from discussions with representatives at the Basic Income Earth Network 2018 World Congress. A basic income is the concept of regular, unconditional payments made to all citizens, regardless of whether they are employed or seeking work. Its supporters believe basic income would provide a safety net and reduce poverty; minimise social security bureaucracy; and allow people greater freedom to choose to work, learn, train, volunteer, care, or start a business. The Carnegie UK Trust is supportive of efforts to undertake a basic income pilot in Scotland in order to understand the potential positive and negative effects of the policy. 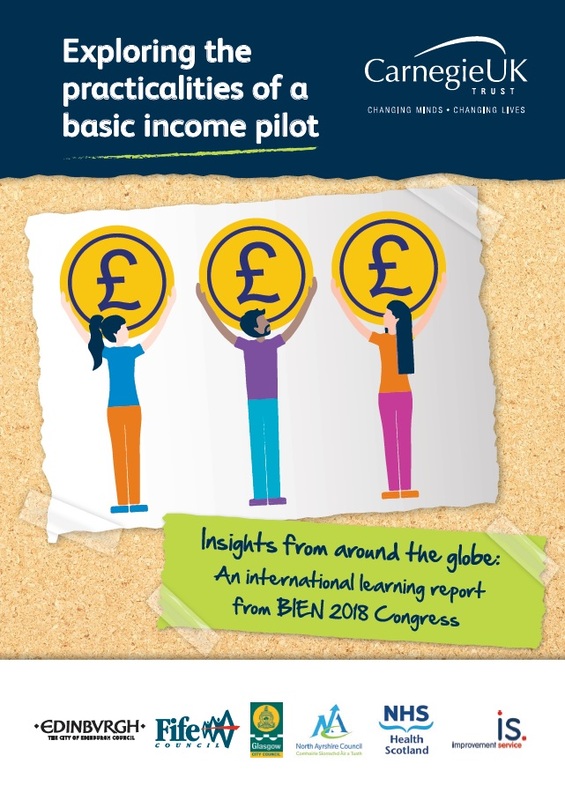 As part of their ongoing Scottish-Government funded feasibility study scoping out how a successful pilot could be undertaken in Scotland, Carnegie UK Trust funding has enabled the Scottish Basic Income Steering Group to produce this international learning report. Its review of international pilots concludes that there is no ‘one size fits all,’ approach to piloting basic income. It makes a series of recommendations around pilot framing, design, implementation, evaluation and communication, in order for a pilot to be delivered successfully within Scotland’s specific political and institutional context. “We are grateful to the Carnegie UK Trust for supporting the international study visit to BIEN Congress 2018, Tampere. We welcome the timely publication of this report as we continue to work to establish the feasibility of a meaningful and ethical citizens’ basic income pilot in Scotland.